Premium quality 14 oz. ceramic travel mug. This ceramic Harry Potter travel mug is perfect for your favorite novel or movie fan! Beautifully detailed with the famous phrase spoken by Severus Snape 'Always.' 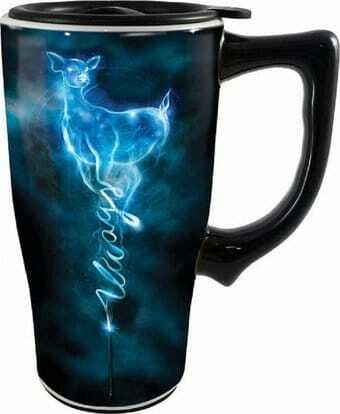 Along with a magic wand and a white doe Patronus image. Mug will hold 14 ounces of liquid and has rubber non-skid base. Each ceramic mug includes a plastic lid to cover your drink as you're on the go!